Cleveland Browns quarterback Baker Mayfield throws a pass in the first half of an AFC North Division game against the Baltimore Ravens at M&T Bank Stadium in Baltimore, Maryland on Sunday, December 30, 2018. Reportedly, the Cleveland Browns will face the New York Jets on Monday Night Football in Week 2 and the New England Patriots in Week 8. CLEVELAND — The Cleveland Browns will not have to wait long to face their former interim coach during the 2019 season. The Browns are slated for a Week 2 Monday Night Football matchup with former coach Gregg Williams and the New York Jets at MetLife Stadium in East Rutherford, New Jersey, according to a report from Manish Mehta of the New York Daily News. After not being retained by the Browns despite posting a 5-3 record as interim coach in the second half of the 2018 season, Williams was hired by new Jets coach Adam Gase to be the defensive coordinator. 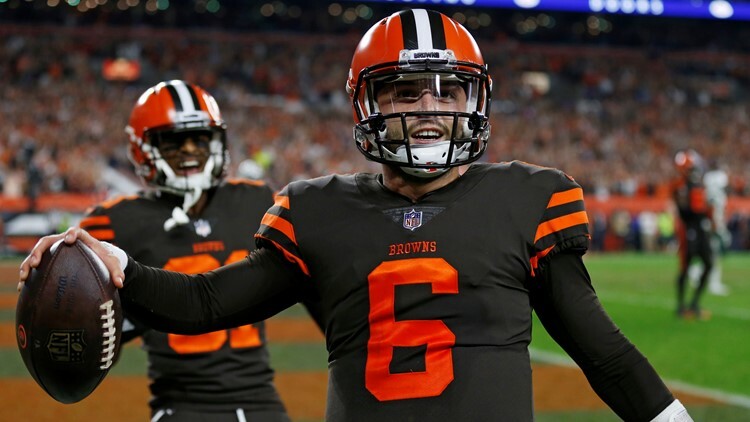 The Browns are 14-12-0 all-time against the Jets, including an epic come-from-behind victory in front of a national-television audience on Thursday Night Football on September 20, 2018. Cleveland Browns quarterback Baker Mayfield celebrates a two-point conversion reception on a pass from wide receiver Jarvis Landry in a 21-17 win over the New York Jets at FirstEnergy Stadium in Cleveland on September 20, 2018. Down by a 14-0 count early in the second quarter, the Browns scored 21 of the game’s final 24 points to close out their first September win since a 28-14 decision over the Tennessee Titans on September 20, 2015 and break a 19-game winless streak. With quarterback Tyrod Taylor suffering a concussion in the first half, rookie Baker Mayfield was pressed into service, but he responded to the challenge and completed 17 of his 23 throws for 201 yards, and more importantly, engineered four scoring drives to complete the comeback. 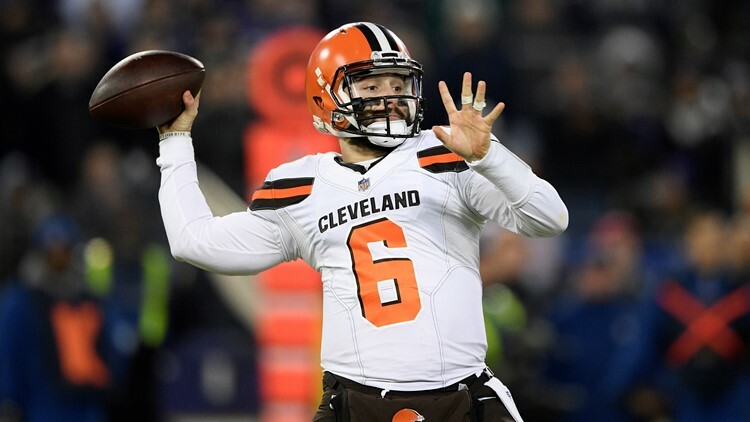 Mayfield did not look back from there, as he maintained the starting job for the balance of the regular season and kept the Browns in the playoff hunt into Week 15. 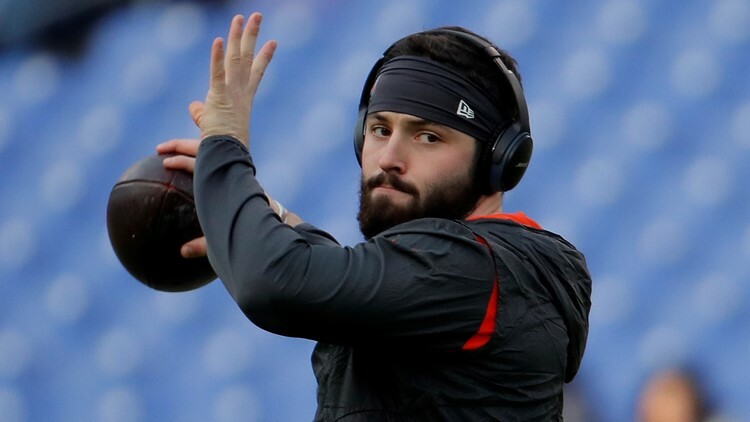 Cleveland Browns quarterback Baker Mayfield warms up before an AFC North Division game against the Baltimore Ravens at M&T Bank Stadium in Baltimore on Sunday, December 30, 2018. After taking over the first-team offense in the second quarter of the Week 3 win over the Jets, Mayfield completed 310 of his 486 attempts (63.8 percent) for 3,725 yards and an NFL rookie-record 27 touchdowns against 14 interceptions. Under the direction of new Browns coach Freddie Kitchens, the interim offensive coordinator for the second half of the 2018 season, Mayfield completed 180 of his 263 attempts (68.4 percent) for 2,254 yards and 19 touchdowns against eight interceptions. Mayfield averaged 281.75 passing yards and 2.375 touchdown throws per game with Kitchens calling the plays. Additionally, The Athletic in Boston reported that the Browns will visit the New England Patriots for a late-afternoon game at Gillette Stadium in Foxborough, Massachusetts in Week 8. The Browns are 13-11-0 all-time against the Patriots, but New England has emerged victorious in seven of the nine meetings since Cleveland returned to the NFL for the 1999 season. The Browns last won in New England on October 25, 1992.